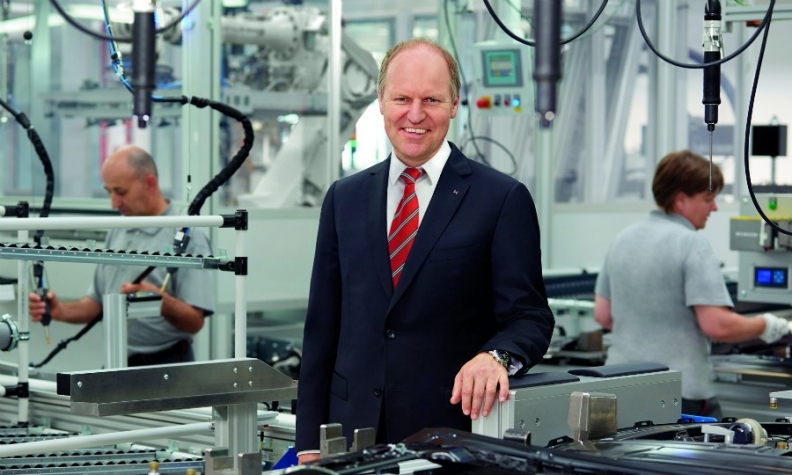 Holger Engelmann on battery systems: "We need to get into the market because at one point — boom! — it will be big." Webasto Chairman Holger Engelmann wants to turn the roofs and thermal management specialist into a battery systems expert in time to capitalize on the forthcoming wave of electric cars from global automakers. It's a bold move, but Engelmann believes that the family-owned German company, which had record sales of 3 billion euros in 2016, already has several skills needed to branch into a new sector. He spoke about this and more with Automotive News Europe Managing Editor Douglas A. Bolduc. Webasto has created a business unit called e-solutions and services to produce battery systems and charging stations. How much will this unit contribute to Webasto's goal of having 5 billion euros in sales by 2020? It will not be that significant by then because we believe e-mobility will really take off after 2020 — probably around 2025. So this is an investment in orders that will come in the future. We need to get into the market because at one point — boom! — it will be big. A lot of our customers will launch their full electric cars between late 2018 and 2022. By that time, more and more charging solutions will be available, and I think this market will take off. Do you plan to install charging stations directly or outsource that? At the beginning, we will work with external partners. But longer term, we will use our global aftermarket organization and their partners. What role will Webasto play in battery systems? We're going to assemble the battery packs and deliver them to the customers so they can integrate them into the car. We expect this to be similar to our roof business, where we collaborate closely with our customers on how to make the systems fit best in each model. Since the shape of the battery will vary depending on the car, we expect to have in-depth discussions with our customers during this process. Will it be a high-volume business? We realize that a large number of battery packs will not come from us. We expect most automakers to do their high-volume models on their own, and we will not be competitors to our customers. We want to be complementary to them in the areas where they don't want to be and we can step in. Main challenge: Turning the roof systems and thermal management specialist into a battery systems expert to capitalize on the wave of electric cars from global automakers. In the battery systems sector, how much business do you expect to be open to suppliers? About 30 to 40 percent of the market. What is your outlook for overall vehicle sales in Europe, the U.S. and China for this year? The U.S. has been pretty stable, but we have seen some indications of a reduction. This has not been very serious, but there is a little uncertainty. Europe is pretty stable in our projections right now. We foresee a small increase. China had a strong sales increase in the first quarter, but we see this slowing down toward the end of the year. But overall, there will still be very good growth. How about Webasto's sales outlook for those markets? We foresee a huge increase in China, with stable to moderate growth in the other markets. What is Webasto's outlook for convertible tops as sedan sales decline? It's a stagnating market and we don't see huge potential for growth in the future. The market has consolidated and the level it's at now is where it will remain. We're seeing this also for sedans. This is because SUVs are getting to be so dominant. They have impacted demand for convertibles as well as sedans. What's your prediction for crossover convertibles such as the Range Rover Evoque, for which Webasto supplies the roof system? These models stabilize or increase the [convertible] segment a little, but I wouldn't see this becoming a major market. Does demand remain high for your sunroofs and panorama roofs? Yes, and I would say China is our major market. The fitment rates for the cars in China are the highest in the world. This has been the trend for years and I think it will continue. The reason for this is that domestic brands are also seeing increasing fitment rates, which is something they didn't have before. Today, Chinese automakers are achieving more or less the same fitment rates as the Europeans, Americans, Koreans and the Japanese.